I’ve had very limited experience with falcons – wild as well as trained – and reading Helen Macdonald’s H is for Hawk, and J. A. Baker’s The Peregrine has made me realize a big gap in my own experiences of the wild. Here, Robin gives a glimpse of his adventures with his companion Shaq. Baker wrote these words 50 years ago: “The tiercel peregrine hurled down wind and rose on a gusting surge of birds. As the wave broke upward he stabbed down through the heart of it, so that the pulse died and the birds dropped back into the snow. A woodpigeon flew on with the hawk, limp and fluttering in the gin-trap of his foot, spilling red feathers and slow blood” – and Robin recounts his experiences of falconry which sounds surprisingly similar to Baker’s, even today. Shaq was bred on the West coast of Canada and arrived as a 3-month old sometime in mid-summer. At this point, humans were completely new to him, so the first step was going through a process called "manning." There are a number of different opinions on this subject - on exactly how you should approach it. The goal of the process is to tame the bird so humans and all the other unnatural stimulation the bird will receive are a non-issue in everyday life. Having worked as for a wildlife management company in Canada that specializes in the use of falconry to deter nuisance wildlife, I've seen my fair share of amazing wild interactions. 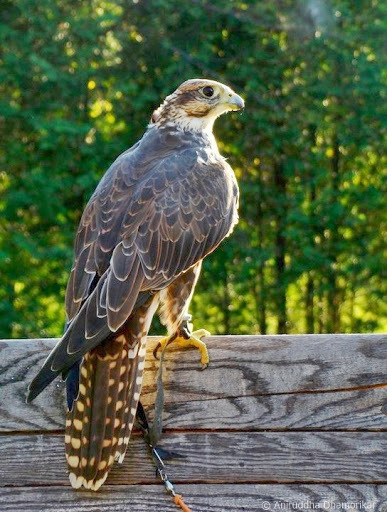 However, what probably hooked me on the sport more than anything was Shaq, a Gyr/Barbary falcon hybrid. In those days (a much-less experienced falconer), I subscribed to the "overwhelm the bird with everything you got" method – he sat on a perch in the middle of my kitchen with people and dogs around all the time. Throughout the process, your aim is to get the falcon to the point where hunger overcomes fear. This does not mean falconers starve their birds - a common misconception. Each falconer takes special care to ensure this doesn't happen by spending countless hours with the bird, building a relationship of trust. When that level of trust finally allows for the falcon to eat food offered by the falconer, the real training begins. The falcon’s body weight is monitored multiple times daily to provide an indication of the bird's hunger level. A fat bird simply will not perform. Starting with full meals from the glove of the falconer, you quickly want to switch the main food source from hand to lure. 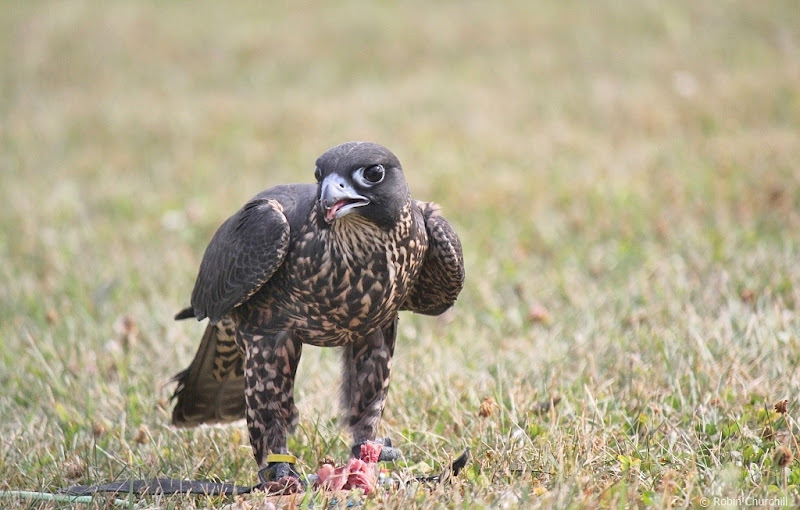 The small leather lure is used as the main tool for retrieving a falcon that hasn't succeeded in catching its quarry and becomes the most important tool. From here your goal is to: 1. improve the flying skill of the falcon 2. build up the flight muscles of the falcon and 3. introduce the falcon to quarry. In Shaq's particular case I chose to achieve 1 and 2 through the use of a kite. By tying his lure to the kite line and sending the kite up into the sky, I was quickly able to teach Shaq to go higher and higher in the sky, improving his flight and fitness. 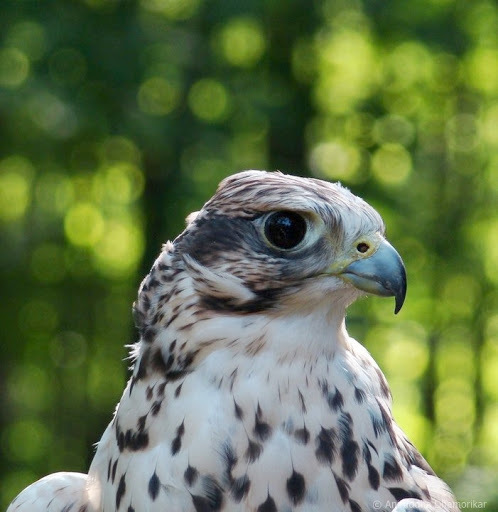 Sugar - a Gyr-Saker Falcon. 2010. Why is this important? Falcons hunt in such a way that typically requires them to take a high pitch. That is, they rely on high position in the sky for the ability to seek out prey that could be miles away, as well as being able to stoop and hit prey that can be potentially twice their size. For a high-flying falcon to be successful with a falconer, and provide the falconer with the greatest show on earth, this high pitch is very important. With enough muscle and flying experience from the kite, Shaq was quickly able to learn about quarry. made her an efficient hunter - and an avid learner. 2010. Racing pigeons can be a very important tool for falconers training falcons. They teach the bird how to properly position themselves in the sky to be successful. Even the best falcons have a hard time catching racing pigeons, when they miss, they go higher and straighter up to have a better shot the next time they get the opportunity. In the early stages I would throw maybe 2-3 racing pigeons for Shaq to get him hooked, followed by a common pigeon that he could easily catch - positive reinforcing the pigeon hunt. This quickly escalated to 3-4 pigeons when he had enough muscle to sustain that amount of flying (stooping 1500 ft and re-mounting isn't easy!). By this time he had learned the game enough that if a racing pigeon made any mistakes, it would be caught. He was regularly flying 1000-1500 ft up a few times a day. A wild Merlin hunts a Savannah Sparrow in the Carolinas of Manitoulin Islands, Ontario, Canada. 2010. There truly is nothing on this Earth as amazing as a falcon’s stoop. The speed and acceleration at which they come barreling towards the ground at is actually indescribable. Words do not do it justice. I was privy to this amazing feat multiple times nearly every single day and could not get enough of it. While flying and catching bagged quarry (pigeons that I serve him) is incredibly entertaining, I knew the real fun would come hunting wild quarry. Living where I do in Ontario, the only real option for Shaq was ducks. When Shaq switched to catching ducks, the real fun began. A pair of Mallard ducks in one of the quaint little lakes in Ontario. 2010. A typical hunt scenario for a falcon like Shaq goes like this: 1. find a suitable sized (smaller the better, surrounded by land) pond with ducks in it. Be careful of the surroundings as you can hardly ever predict where the chase will happen (power lines, roads, buildings, fences are all issues). 2. Get a safe distance away from the pond - you don't want to scare the ducks away with the commotion involved with letting the falcon go 3. Let the falcon go 4. Wait until the falcon is in position then rush the pond as fast as you can (with no regard for human safety) screaming and carrying on like an idiot to get the ducks to leave. 5. Watch the stoop and wait for a cloud of feathers at the end of it! The best stories I have of Shaq always involve wild falcons coming in to ruin a hunt. A few particular stories stick out in my mind. While hunting Shaq in Ottawa we chose a small stream next to a horse farm to hunt. There were probably 20 ducks in the stream, with a fair number of obstacles around. Our plan was to get the ducks to flush away from the obstacles and out over the horse pasture. Easier said than done. Ducks (and any birds for that matter) somehow become incredibly intelligent when a falcon is around. For those of you who have no experience with falconry - believe me when I tell you, most birds are not easy to catch. They are way smarter than they show humans - think ducks in a park. 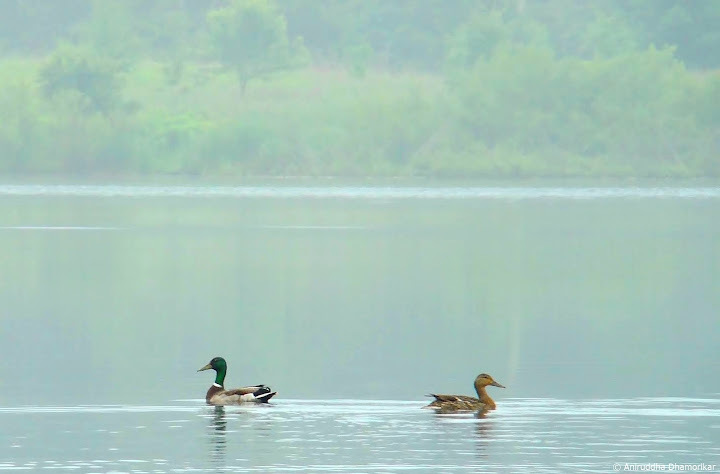 These particular ducks, knowing a falcon was about to hit one of them at over 100 mph, decided their best defence was to fly low along the stream and not over the pasture. This didn't stop Shaq from chasing them down the stream full speed, what did stop him was a wild female Peregrine falcon that wanted a piece of the action. She too came right in behind the ducks trying her best to knock one down. All of this occurred maybe 30 ft in front of me! Once both falcons had decided they lost, they switched their attention to each other. Watching a dog fight 100 ft off the ground between two strong falcons is quite a sight. The female peregrine was nearly twice Shaq's size. Shaq flew at 550 grams, that Peregrine was likely in the neighbourhood of 900 grams. This certainly didn't deter Shaq from trying to chase her away from "his" spot. After about 5 solid minutes of both birds trying to hit one another, the female Peregrine decided it was enough for her and flew off. I called Shaq down with the lure and he was panting like a dog from all the effort exerted. If anything, he got his exercise for the day! Another time I was flying Shaq near the abandoned airport that I often used to train falcons at. On this particular day I was going to go serve him a bagged duck. I was determined to serve him the duck when he was climbing hard, to teach him that good things happen when he is really pumping to gain more altitude. I personally have a hard time with being greedy when training a falcon - that is, I will sometimes hold out for something better than originally planned - rather than just teach the simple lesson I set out to teach. Of course, that happened on this day. He was climbing incredibly hard and I could've served him on multiple occasions but didn't, I wanted to see how high he was going to go! The issue with this is that you risk serving him after he's quit climbing and just coasting around way up there, not teaching him anything useful. My greed wasn't a fault this time. Just before I wasn't able to see him any more (usually north of 1500') I was able to serve the duck while he was still working at it! Now the second issue when using bagged ducks, is that they don't all fly as well as you would like them. Sometimes they come out of the launcher and fly 10' and give up! its size, making it uneasy enough to flap its wings and later fly in the opposite direction of the Peregrine's. Again, on this day, I got lucky, and got a really strong flier. The duck took off fast and was climbing hard straight downwind of Shaq's position. When he winged over into the stoop the duck was already 25' up off the ground and moving. I lost sight of Shaq because of the angle he was coming down at so I knew to immediately switch focus to the duck, I picked Shaq up when I heard him sizzling through the sky (Yes - you can actually hear them cutting through the wind). He was moving faster than I had ever seen him move and the stoop took longer than usual due to his higher-than-normal position. When he finally hit the duck, it was directly in the back of the head, killing it on impact. Now, that typically would have made my day, but I got a bonus this particular time. A wild tiercel Peregrine came stooping out of the heavens right behind Shaq and drilled the duck before it even managed to hit the ground! By the time the duck hit the ground, both falcons were coming in hot to claim their prize. Knowing the danger another raptor can present, I immediately started sprinting towards them. The two falcons were wrestling each other on the ground when I got there, but the wild bird took off as soon as I arrived. Shaq, no worse for wear, hopped onto the duck and finished his daily meal. What a rush! Robin is a graduate from University of Western Ontario, and a Biologist at Predator Bird Services, Canada. 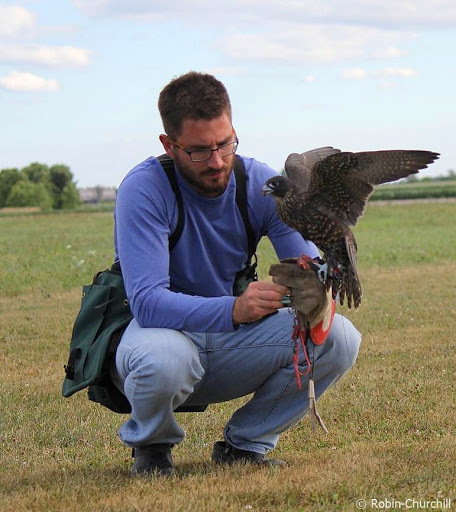 He’s an expert falconer, and has conducted research on the distribution and abundance of submerged aquatic vegetation and dreissenid mussels in the inner Long Point Bay, Lake Erie. He’s an avid ethical hunter, trainer of dogs, and a fierce conservationist; prefers to spend time in the wild, and is rare to find on social media. His work has been showcased here. This work is © Robin Churchill and has been published with his permission. All the views expressed in this article are that of the author. No part of this article can be used without prior permission of the author. Please write to me for more information.